I have found that human force always runs on the wheel of the fear factor. The fear of not getting a job, fear of losing job and fear of not getting promoted fear of stability lives within the people which drives them for any professional course. The point is that education has been linked with pay cheques and long-term sustainable career growth vision either never existed or they are short-lived. Today my article speaks about a few of the observation I had with students who were doing some professional courses. Executive MBA one of the most demanding courses for a working professional who has corporate experience of around 2 to 5 years and is looking ahead for some course to give more shape to their career. This market has huge demand since most of the early education was not stable due to various factors and after some stability in the job, they look to get into some good education qualification so as to get a pay hike and more stability. Well pay hike remains the prime focus for joining these courses rather focusing on the actual knowledge-based approach where one will add value to the organization. I have witnessed in many places students change their preference for selected specialization subject changes as they go through the classes. Doing a work and study balance is significant activity and hence most of them change the subject just to get the degree and not becoming a master in the subject. The change of subject and specialization is not always for a better degree or knowledge achievement but more driven by where I will get more pay hike remains the key factor. Linking the salary growth with education simply limits the area of focus. One needs to have a broader vision for education and knowledge since the changing dynamics of the global economy and Indian economy keeps nothing unchanged even for a limited period of time. An educational degree should be always linked with the long-term vision of one’s life and not influenced by the current state of influential factors. The problem is within the Indian mindset where every education is linked with job and pay scale. Even in skill development, I find that the key focus is getting a job and let the rest of knowledge gaining come to an end. Technology is also changing the dynamics of skill development and hence one needs to be with an academic touch over the length of the career. Career is not for 5 years or 10 years time frame. It spans over a period of 30 to 40 years and hence one needs to understand the dynamics of changes in job life. Doing MBA and getting into a job and securing a position –well all these are myths as on today. Nothing is permanent and hence continuous learning is the only survival lifeboat. Once a good job or hike in pay scale is achieved the course is forgotten and the studies are winded up. This mindset leads to the slow growth of fear factor within the people that one fine day they will lose a job. 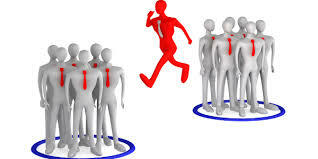 The fear of losing a job creates many repulsive activities which are less knowledgeable and more diplomatic in nature. I further find that often courses are chosen by one based out of others view and less on one’s own understanding. This is another grey area where I find the change of courses happens when one gets enrolled in one course and finds the subject to be beyond his limits. In many cases, one changes the course since they just want to get the tag of MBA just beside their CV to uplift there pay scale. Candidates lack vision for their career and this lack of vision leads to more problem where series of job changes comes into play. Courses should be chosen with deep insight about where one finds the position to grow in the next 10 to 15 years. Further doing one course will not be sufficed to live the life. With changing times periodic courses needs to be adopted.